I won’t exaggerate saying that a not-so-good mattress can really ruin your sleep. But don’t worry: even if you don’t have a budget to invest in a new mattress, you can still save the day. In the majority of cases, when a mattress isn’t too old and too shabby, adding a good topper can completely alter your sleep. So, let’s take a look at six top rated mattress toppers and see which one will suit your needs the best. Mattress Topper Materials: Which One Would Be Perfect for You? Should You Take Your Sleeping Position Into Consideration? The manufacturer offers more than the majority of other companies. 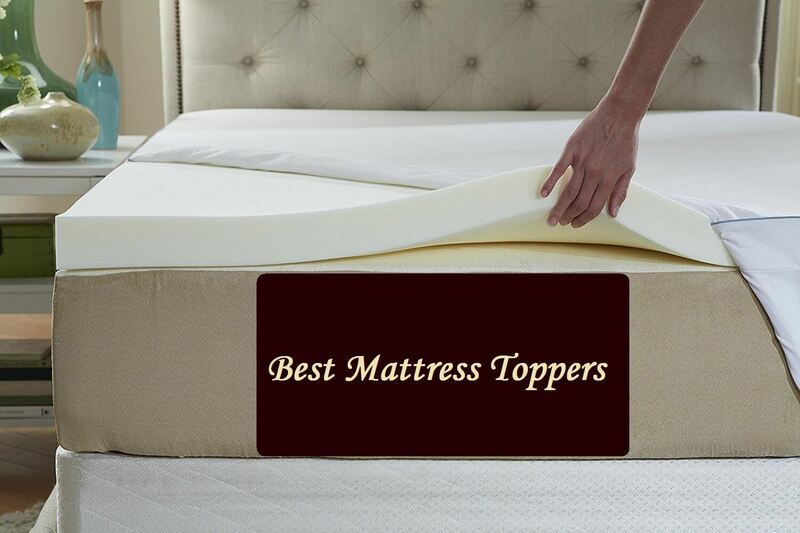 Because the topper is dual and combines a firmer layer with an additional softer one, it deserves to be considered the best mattress topper in this price category. This mattress topper is a great investment. It works for different sleeping positions and you can adjust it according to your personal preferences. This is a true flexible topper that can satisfy many users. The cooling gel memory foam layer. The quilted cover, soft and filled with fiber. The manufacturer promises that the topper provides a cooling effect, which I found to be true. It doesn’t feel like sleeping with your AC on; but still, you won’t feel hot either. What is really great with that mattress? The best thing about this mattress topper is how universal it is for different sleeping positions. The combination of two layers that have different firmness levels really allows you to feel equally comfortable on your back, stomach, or side. Plus, if you feel like you need something firmer or if you only sleep on your back, you can simply take the softer layer off and enjoy the bouncy memory foam feel. What is wrong with that mattress? The worst thing about this topper is the challenge you might face when trying to make your bed and its components stay in place. Let me explain: because the two topper layers aren’t sewn together, the fluffy top layer might move around at night with your sheets. So, think about getting a fitted sheet or maybe an extra-large one to tuck its ends under the mattress, just to keep your bed neat and tidy. Overall, my experience with this topper was very pleasing. And I’m sure that it has the potential to transform your old mattress and become the best mattress topper for you. Sometimes, to earn the right to be called the best mattress topper, the item doesn’t have to offer appealing extras. It just has to be comfortable. And that’s what I can say about this gel infused memory foam topper by Lucid. This mattress topper is super comfortable. Additionally, it also offers great value for money. Being very reasonably priced, it is nicely made, offers good comfort levels, and even helps users sleep cooler. To me, that’s a great deal! Its minimalistic construction hides a lot of benefits inside. The topper is made of an open cell memory foam, which is infused with gel bits. It has special ventilation channels, which allow for free airflow and don’t let your body retain too much heat. The foam itself is very responsive and provides great support. When I was sleeping on it, the surface felt firm enough to support my body and soft enough to save my pressure points from pain. So, it’s safe to say that the combination of firmness and softness is just in the right middle. The coolest thing about this mattress topper is the value for money that it offers. For under $100, it combines a set of cool features. It is comfy, that’s for sure. Additionally, it provides a cooling effect, which makes it ideal for temperature regulation. For such a price, that’s a real steal! The worst thing about this topper is that it might be too thin and too soft for you if you need some significant changes concerning your current mattress. You see, 2 inches won’t drastically change the sleeping experience for you. This topper is a great option if you simply want some additional comfort. Sadly, it can’t save your dying mattress. Overall, the Lucid topper is a worthy contestant and can be surely called the best mattress topper in its price range. It won’t transform your old mattress into a new one, but it can certainly provide you with some additional comfort and cooling effect. Meet the next contender – Pure Green Latex Mattress Topper. Produced by SleepOnLatex, this model is a perfect variant for people who can claim only the natural product to be the best mattress topper. However, what makes this mattress topper special is its customizability. When shopping, you can pick its thickness, size, and even the firmness level. This means you can get the perfect topper based on your personal needs and preferences. It is made of 100% natural latex, which is the byproduct of the rubber tree. It features a ventilation system, which allows the air to flow freely and helps your body and skin breathe and stay cool. 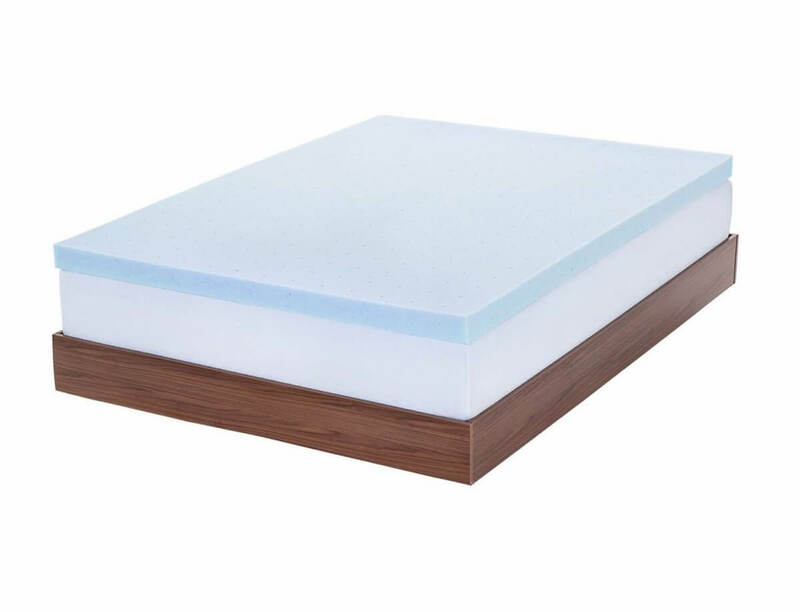 This topper adds more bounciness to your mattress, creates an additional supportive layer for your body, and reduces the pressure from the pressure points. I can honestly admit that I felt super comfortable sleeping on it. The absolute best thing about the Pure Green mattress topper is its customizability. When ordering, you can pick the size, the thickness (from 1” to 3”), and the firmness level of the topper. Depending on your specific needs, you can get a soft, a medium, or a firm topper. Get the thickest one if you want to make as much change to your current mattress as possible or the softest topper if you simply need an additional comfort layer. The worst thing about this mattress topper is its price. Let’s face it: paying more than $200 if you only want some extra comfort might seem to be too much. Still, the topper is worth investing in, it’s just not a good option for people with a tight budget. This is crazy, but, despite its high price, I would definitely recommend this mattress topper. It has a potential to drastically improve your sleep quality, and I’m sure you’ll be happy to call it the best mattress topper you’ve ever tried. 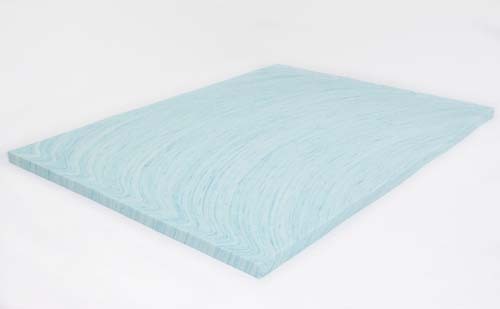 This topper is made of the company’s proprietary SmartFlow Gel Memory Foam (3-lb density). It is 2 inches thick and comes in all the regular mattress sizes. The topper is wrapped in the same fabric the company uses for their mattresses. This model also has straps on all four corners, which keeps it in place during the night. The absolute best thing about the Alexander Signature topper is it’s cooling properties. Despite being made of memory foam, this mattress topper really helps with temperature regulation thanks to its gel component. It’s an ideal option for people who love that hugging feel of memory foam but hate sleeping hot. 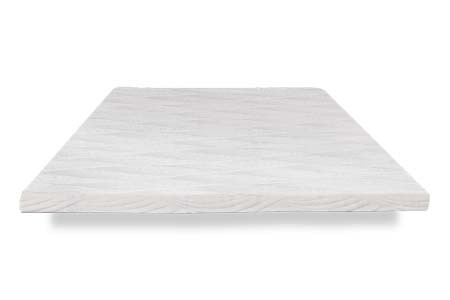 The worst thing about this model is the fact that it might be too thin for some users, especially heavier ones who want to add some comfort to their overly firm mattress. The thing is, this is a foam topper. And because it isn’t that thick, heavier users might sink deep into it and hit their mattress. To be honest, this mattress topper isn’t flawless. Still, it is comfy and can satisfy many users, especially those who hate sleeping hot. Want to test it yourself? Click here to order! When ordering the DreamFoam topper, you are risking (in a good way) to completely change the way you sleep as this model can become the best mattress topper for your bed. The thing is, it feels heavenly comfortable. Because this mattress topper allows for a generous amount of cradling, which is perfect for pressure (and even back pain) relief. 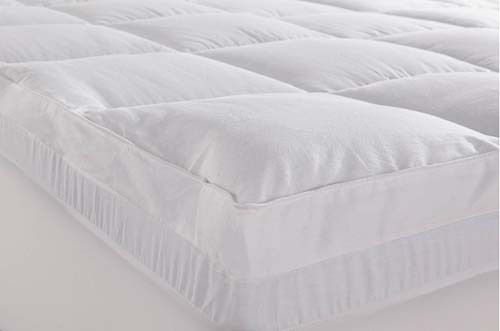 It’s made of the Centi-Pur certified visco-elastic memory foam, which means it doesn’t contain any harmful chemicals. This topper looks like a blue marshmallow but feels firmer, squishier, and more responsive. Since it has the infused gel swirls, it provides a cooling effect and some extra bounce. But the best thing about this topper is how it cradles the pressure points and allows the muscles to relax. I must warn you: this topper isn’t super firm. That’s why it kind of envelops around the body (but not too much), manages to support all the right spots properly, and helps you relax completely. The worst thing, in my opinion, is that it might be too soft for some users, especially the heavier sleepers. As it allows your body to sink into it, and it’s only 2” thick, heavier sleepers might not feel the effect this topper is supposed to cause. To tell you the truth, despite its minor flaws, I would sleep on this mattress topper every night. And I believe that chances are high it will help you improve your sleep quality. 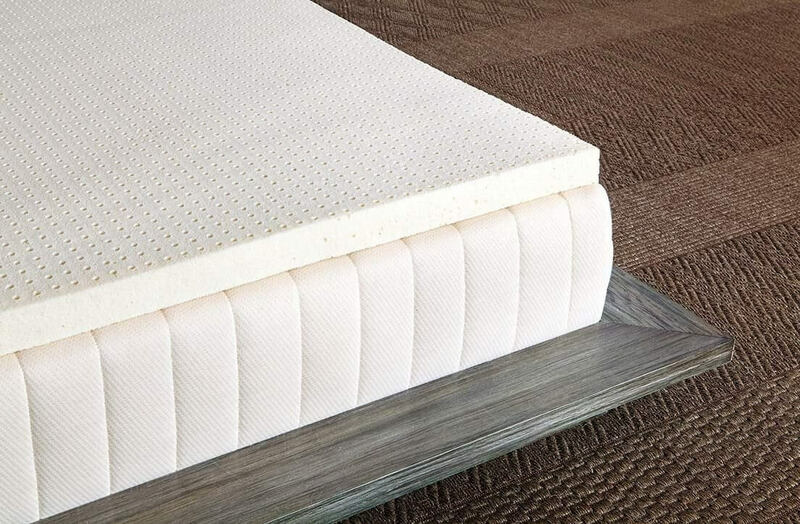 The last item on our list is this mattress topper by Latex for Less. Being made of a 100% natural material (pure latex, nothing else), it has the right to be called the best natural mattress topper. It is hypoallergenic, safety certified, and (most importantly) comfortable. Its construction involves only one 3-inch layer of latex. However, because this topper comes in three different firmness options, it features different latex density. The soft model uses the D55 Density (15 ILD), Medium has the D75 Density (28 ILD), and the Firm version employs the 85 Density (36 ILD). The topper comes with a 5-year warranty, which only proves that it’s quality made. The absolute best thing about this model is, of course, the fact that it’s 100% natural and safe for your health. Latex is hypoallergenic and antibacterial, so this is a good news for allergy-prone people. It also doesn’t have a harsh odor. The biggest drawback of this topper is its price. Of course, we all know that natural materials cost more. Still, this small issue might be a huge disappointment for many users. Despite some minor drawbacks, this mattress topper definitely deserves your attention. It is natural and comfortable, which is a perfect combo. A mattress topper might not seem like the most important item in your bedroom. Still, it takes a lot of time and effort to find a good one. Overall comfort level. Firmness and thickness of a mattress topper are important, but no matter how supportive or soft it is, it has to be comfortable. Materials used. Obviously, different users prefer different mattress topper materials. However, we always make sure that those materials (whatever they are) are safe for your health and of a high quality. Value. We don’t want you to pay more than needed (for instance, just for the brand name). So we always look for something that can offer good value for money. If we recommend an expensive mattress topper, rest assured that it’s of top quality. If we suggest you buy a cheaper model, it’s still going to be comfortable, we promise. Company reputation and warranty. Buying from a reputable company and getting a good warranty period ensures your safety as a customer. Reviews. One model cannot be perfect for all. We always check other users’ reviews to see how each mattress topper works for different body types, sleeping positions, and other people’s personal preferences. If there was a universally comfortable mattress (or mattress topper) material, our help wouldn’t be needed. However, you and I both know that different materials are suited for different sleepers. Memory foam. 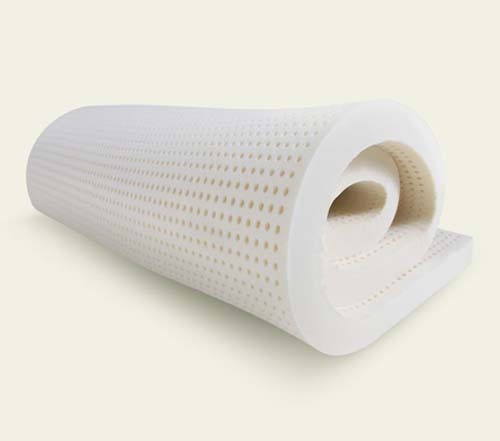 This is the most popular material for mattress toppers. Memory foam is cradling and hugging, which makes it ideal for pressure relief. At the same time, it can be rather supportive if high-density foam is used. However, this material might make you sleep hot. Additionally, it oftentimes has a noticeable odor upon arrival. Latex. Such toppers are made from natural materials and combine durability, comfort, and support. They are naturally hypoallergenic and antimicrobial but tend to be quite expensive. Cooling. These toppers are usually made of gel (oftentimes combined with either foam or latex) and are perfect for people who tend to sleep hot. Feather. 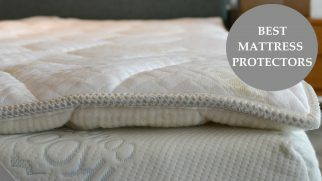 Feather mattress toppers are heavenly soft and add a luxurious feel to your bed. They are breathable and don’t usually sleep hot. Additionally, they are quite good for motion isolation. At the same time, feather (or down) toppers tend to lose their shape and require regular fluffing up. They also are on a more expensive side. Wool. This material is natural, soft, and super comfortable. Wool toppers are also very durable and naturally hypoallergenic. They cost a bit more but offer good temperature regulating properties. Unfortunately, wool toppers aren’t that supportive. Fiber. Such toppers are usually made of cotton, polyester, or a combination of both. The fibers mimic the feel of down and feathers. This is a very budget-friendly option (in the majority of cases, although some manufacturers like labeling their product “organic” and raising the prices even when it isn’t truly organic). However, fiber mattress toppers aren’t that durable. Short answer: yes. Your sleeping position determines what mattress and topper you should get. Because your spine is positioned differently depending on how you sleep, your mattress topper has to correspond in order to keep the spine in a neutral position. Mattress Topper for Side Sleepers. Generally, this sleeping position requires a rather soft mattress topper and a generous amount of cradling. If you are a side sleeper, you need a topper, which will allow sinkage for the protruding parts of your body. At the same time, your body requires proper support for the correct spinal alignment. Just make sure that it’s a soft support, not a firm one. Back sleepers. This sleeping position needs a firmer mattress topper with a moderate amount of sinkage. A thinner mattress topper will suffice since back sleepers don’t really need much cradling. Stomach sleepers. This type needs something in the middle. Because your spine and neck kind of curve and twist when you’re sleeping on your stomach, you need some sinkage to accommodate the pressure points. At the same time, your mattress topper needs to be quite supportive and not too soft to keep the spine in a neutral position. 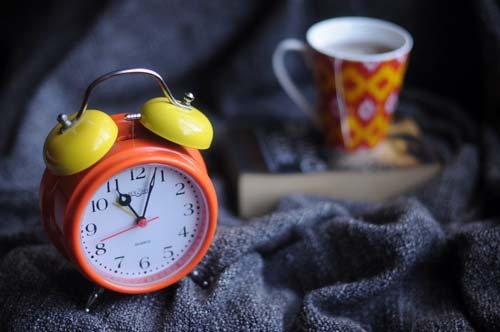 Investing in a mattress topper is really worth the money as it can completely change the way your mattress feels and improve your sleep quality. you might also extend the life of your mattress by reducing the impact on it. After taking a close look at these 6 mattress toppers, I’m ready to pick the best one. In my opinion, it’s the Pure Green Natural Latex Mattress Topper by SleepOnLatex. Want to know why? It is natural, bouncy, supportive, and just super comfortable. Yes, it is pricey, but it’s totally worth the money. You can customize it and choose the size, the thickness, and even the level of firmness, which means its chances to disappoint you are close to zero. I am sure that this topper is able to turn your sleepless nights into a sound and peaceful sleep.